If there’s one thing that history’s greatest love stories teach us, it’s that love doesn’t come easy. Finding true love takes extraordinary sacrifice and perseverance, trusting that all the hardships one endures on the road to finding that perfect someone will be worth it in the end. This is something that David’s Bridal founder David Reisberg undoubtedly understands, as today, after considering millions of women who have come into his stores to try on dresses over the years, he has finally chosen a bride. Wow! This is truly a tale of love for the ages. 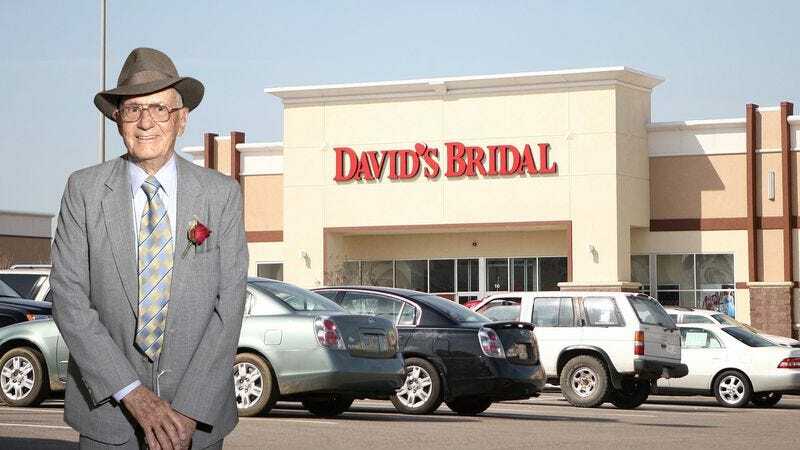 Reisberg founded David’s Bridal in 1950 with the dream of finding his perfect bride, spending seven days a week in his stores pacing anxiously behind a curtain with a single rose in his hand, hoping that one of the women who entered his stores would hold the key to his love. Now 97, his empire has grown to more than 300 stores in 45 states, but all of that was meaningless to him until today, when a 39-year-old nurse practitioner named Candice Minarik came into his Roseville, CA location for a bridesmaid dress fitting and immediately won over his heart. Immaculately dressed in the same baby-blue tuxedo he’s been wearing every day since 1950, the frail Reisberg had two stockroom employees wheel him out to his beloved on a dolly, after which he bowed his head, presented her the rose, and declared his intention to marry her right there in the store. Reisberg then offered her a 30-percent-off coupon so she could buy herself a beautiful gown for the occasion. Without waiting for her response, Reisberg announced that, having found his bride, he would be closing all 300-plus David’s Bridal locations across the country, effective immediately, and that the retailer’s thousands of employees would be let go without severance. Wow! It really is like something out of a fairy tale. It just goes to show that good things come to those who wait. Here’s hoping David and Candice share many blissful years together and live happily ever after!